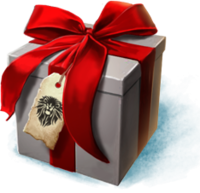 Wintersday is almost upon us and as is tradition we will run Secret Santa again!! An awesome chance to give and receive pretty shiny packages. So what does your heart desire? Did you miss an old festival reward and never got around to buying it on the tp or do you need that last pesky item for a collection? Do you like to turn into a huge snowball at guild missions but were never able? Or are you simply saving for your next legendary? If you can’t think of anything in particular, just give Santa an idea of your likings and something will be gifted! You simply sign up (at latest 19th December 2018 at 23:59 GMT) by replying on this thread or by sending Nova an email ingame (Persephone.5384). Your guild wars 2 account name (the one with the numbers at the end). What your ideal gift would be (keep in mind you might not get your heart’s desire if you ask for something ridiculously expensive). We recommend that you aim for your gifts to have a value of at least 5g. It's not all about the monetary value of the presents, of course, but we'd like everyone to feel they can take part regardless of how much they play and also retain a certain minimum worth. You are naturally welcome to exceed this. If it so happens that you don't receive your gift, there will be provision for this so don't worry; if things don't work out with your Santa you will still get some shinies, as long as you sent yours. Edit: Just give me something... Could use some more agony infusions for my naked fractal Norn. Since I am always crafting Legendary stuff, something in the line of T6 mats or alike will be appreciated, but you may surpise as well. Sign me up any mats for making the gift of condensed might for Legendary pvp armour. Dear Santa, I wasn't always around because I had a really busy year, but I think you know I've done my best. I was never mean to other players and I helped those who needed it. I still haven't spoken in TS, which I promise will change as soon as I figure out how to fix my mic input. I might have used naughty words a few times when trying to do jp, so sorry for that... Please bring me something shiny <3 The things I'd want the most are Rhendak's Signet or Sam or Pendant of Arah (exotics), as I still need those for the collection, but I'll also be happy with coarsed or rugged leather squares. A date is what I want for Xmas. Someone to run around maps with and be CRAZY with me. or at least 10 shovels for my personal guild hall. Some cool weapon skin would be nice!